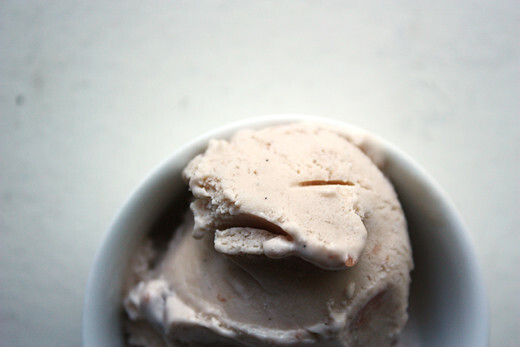 Strawberry jam ice cream: pretty pretty pretty. And sweet in just the right subdued kind of way. It's lovely as a scoop on its own, and amazing mixed with meringue and raspberries. You MUST use homemade or good quality store-bought jam - the kind with chunks of fruit in. Place a large metal bowl in the freezer (or at least the fridge). Gently heat together the milk and vanilla pod in a solid-bottomed pan. As it comes to the boil, give it a whisk so as to disperse the vanilla seeds into the milk. Cover, and leave to infuse for 20 minutes. Beat the egg yolks with a fork in a small bowl and then mix in a little of the milk to loosen them. Add this to the vanilla-milk mix, whisk together and then cook over a very gently heat, constantly stirring with a wooden spoon, until the mixture has lightly thickened - do not allow it to boil. Take the chilled metal bowl from the freezer (or fridge), pour the mixture into it, and whisk thoroughly to cool quickly. Now whisk in the cream. 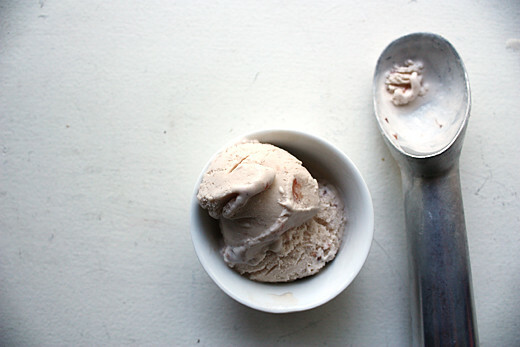 Stir in the jam, pour into an ice-cream machine, then churn and freeze according to the manufacturer's instructions. * Because I can't afford to use a vanilla pod for every recipe that calls for one, I buy Nielsen-Massey's pure vanilla bean paste. In this recipe, I used 1/2 tsp. You could use a good quality vanilla extract, but the paste includes the seeds, which I think are crucial in a good custard. This looks so beautiful! I love strawberry ice cream to begin with, so this is perfect. I bet the strawberry jam just intensifies that flavor. Yum!! I love the elegant simplicity & delicate light of these shots! 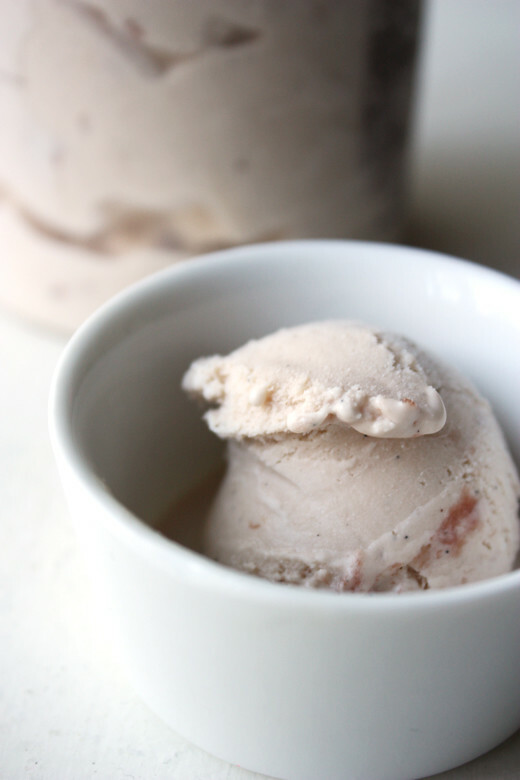 This is the kind of wholesome, few-ingredient ice cream that we're drawn to. Very pretty. I'd be tempted to try this with every type of homemade jam we create! I saw your comment on Twig & Thistle about my Halloween dessert table. Yes, I got the cake stands from Target. Because they are considered a seasonal item, they aren't shown on the website. They're in the Halloween section with the other Halloween decor. They are only $4 each! Isn't that phenomenal? I want a scoop! Lovely blog! I made a bunch of jars of homemade strawberry jam in July!! And my ice cream maker is calling my name!!! This looks sweet, simple and simply perfect! I use Nielsen Massey vanilla paste too. It's replaced me ever using a vanilla pod anymore because it's just as good! This ice cream looks delicious. Love the subtle shade of pink. Thanks for sharing this recipe. I made them and came out nice. Plz blog more I love your taste in food. Pelatihan SDM is network marketing and training information or training an employee who has worked with many consulting firms and training institutions and training of human resources.